Adirondack Vacation Guide: World Cup Snowboarding at Whiteface! World Cup Snowboarding at Whiteface! 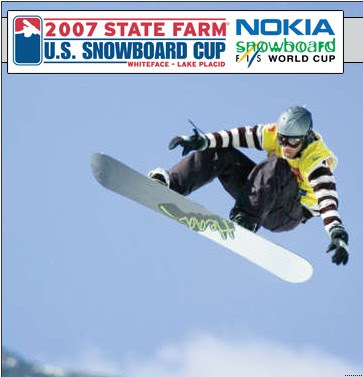 This Week, Thursday March 8 and Saturday - Sunday, March 10-11, Whiteface will host the State Farm US Snowboard Cup. Thursday and Sunday will see the SBX races including back-to-back world champion Lindsey Jacobellis (Stratton Mountain, VT), double X Games gold medalist Nate Holland (Squaw Valley, CA) and recently crowned U.S. champions Callan Chythlook-Sifsof (Girdwood, AK) and Nick Baumgartner (Iron River, MI). Jacobellis, Holland and Chythlook-Sifsof all podiumed earlier this month at the opening World Cup of the season in Furano, Japan. Saturday, March 10 will be the half-pipe competiton with reigning halfpipe winners Gretchen Bleiler (Aspen, CO), the 2006 Olympic silver medalist, and ’07 Grand Prix champion Tommy Czeschin (Mammoth Lakes, CA) back along with two-time X Games champion Steve Fisher (Breckenridge, CO) as the ‘Bear Superpipe’ hosts the world’s best for the third straight year. Also on tap for Lake Placid is the crowd favorite Paul Mitchell Progression Session, this year staged at the MacKenzie Intervale Ski Jumping complex, home of the 1980 Olympic ski jumps. Riders will rocket down the ski jump outrun of the 120-meter ski jump into a monstrous 30-foot quarterpipe. Up for grabs at the end of the jam session is $7,500 in cash, plus an additional $2,500 for the rider who stomps the Rip It Trick of the Day. Watch the halfpipe competition on NBC, Sunday, March 18 at noon. All events are free to the public, for more information click here.